Team D3 Go! - Jelger Wiegersma - D3 Go! Today we introduce Team D3 Go! member Jelger Wiegersma. These members are sponsored Magic: The Gathering – Puzzle Quest players at Pro Tour events in 2017. Please follow them on Twitter and watch them compete at events via Twitch. Top Pro Tour Results : Pro Tour Seattle 2003 Winner. Grand Prix Gothenburg and Indianapolis winner. Five time Pro Tour Top 8 competitor. Hall of Fame. 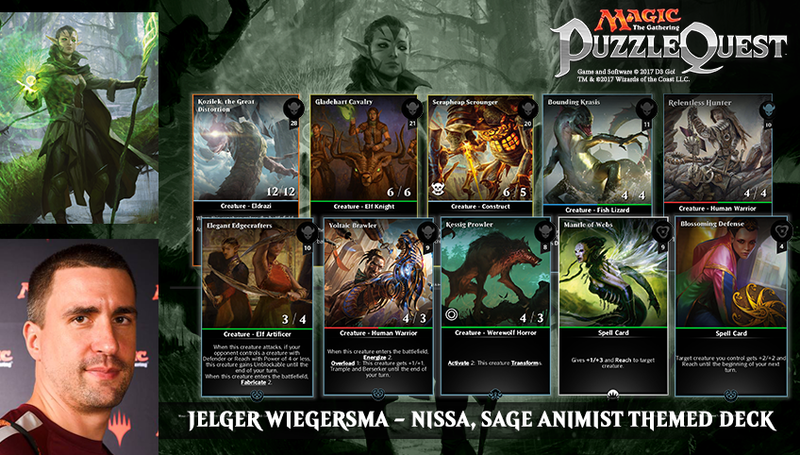 Your Go-To Magic: Puzzle Quest Deck for this PW: Kozilek, the Great Distortion, Gladeheart Cavalry, Scrapheap Scrounger, Bounding Krasis, Relentless Hunter, Elegant Edgecrafters, Voltaic Brawler, Kessig Prowler, Mantle of Webs, Blossoming Defense. I love the long grindy games in Puzzle Quest where I keep trading with Berserkers and eventually win by recurring Scrapheap Scroungers or by overpowering them with Kozilek or Gladeheart Cavalry. My Spells help me survive against flyers. The Nissa Ultimate which makes the whole board explode is great too.